In her early forties, my mother went looking for God. When she got home, she decided we all needed to learn it. She also tried to get us to come to church with her. But we protested, and my Mom’s sojourn with the Baptists was short lived. Then something happened which changed our lives forever. In the spring of 1978, Joey Clark invited my brother Paul to church. Joey’s church—the Evangelical Covenant Church of Attleboro—was having a Sunday school picnic and Joey wanted Paul to come with him. Lured by softball, hot dogs, and the chance to spend an afternoon with Joey, Paul went along. He had such a good time that the next week, Paul ended up at Sunday school. One by one, my family followed Paul—first my mom, then my sister, then me, then even my older brother became evangelicals. My dad was the last to come. Not long after my mom started attending the church, he drove by the place to give it a look over. He saw the word “evangelical” and that was enough. “I’m not getting involved with a bunch of holy rollers,” he said. And that, at least for a time, was that. The local Covenant Church had been founded about 70 years earlier by a group of Swedish immigrants, who called themselves “Mission Friends.” They worshiped in Swedish and sent much of their money to support missionaries in China and Africa. By the time we met them, the “Covenanters” as they were now known, had already outgrown two buildings and settled into a stylish, modern building along Route 152, a stone’s throw from the on-ramp to Interstate 95. The church was built mostly by volunteers—when we first arrived, there were still construction pictures hanging in the fellowship hall. Anything I know about Jesus, I learned first from the people of the Attleboro Covenant Church. Most teenaged boys are unlovable: awkward half-men, half boys, full to the brim with self-doubt and testosterone, with bodies still emerging from the cocoon of childhood into adulthood. As an outsider among my peers—nerdy, overweight, more Neville Longbottom than Harry Potter—I was particularly unlovable. Yet the people of the Covenant church welcomed me with open arms, though they hardly knew our family. Not only did they welcome me, they also taught me something remarkable—that God liked me. I learned that lesson first from Ruth Cederberg, my first Sunday school teacher. Aunty Ruth, as we called her, was tall and always impeccably dressed, and she treated us like family from the first day we met her. Aunty Ruth taught eighth grade Sunday school. Our project for the year was painting a mural of Noah’s ark in the back stairway leading from the fellowship hall to the youth room. I painted what were supposed to be giraffes but ended up looking like some strange alien creatures, with yellow bodies and odd -shaped heads. Aunty Ruth thought they were perfect. I don’t recall any lesson from that year in Sunday school except for this one: God liked us. He was our friend, and was kindhearted toward us. That belief, and an unwavering trust in the Bible, was the bedrock on which Aunty Ruth’s faith and the Covenant church—like all evangelical churches—was founded. It’s a remarkable and perhaps crazed idea: that God likes us, that the Creator who spoke the universe into being and flung the stars into the heavens billions of years ago also knows each of our names. And all of our sorrows. The phone rang at 4:30 a.m. on the morning of October 22, 2006. When the phone rings that early, it’s never a good sign. I lay in bed as my wife got up to answer the phone and braced for the worst, sure that my mother was dead. She’d been diagnosed with multiple sclerosis (MS) at the age of sixty, seven years earlier, and over the past two years her health had declined drastically. For the first sixty years of her life, my mother rarely sat still. When my wife, Kathy, was expecting our first child, my mom recounted how even when she was nine months pregnant, she still enjoyed mowing the lawn in the middle of summer. She finally quit when a neighbor, also pregnant, came out and told my mom to go back inside and put her feet up. Apparently, all the other pregnant women in the neighborhood had put her up to it. “You’re making us all look bad,” the neighbor told my mother. But MS had left my mom confined to a wheelchair; unable to do even the simplest tasks for her self. She’d been hospitalized several times, and we thought she wasn’t gone to be with us long. So we’d prepared for this call. After a few minutes of talking on the phone, Kathy called up to me. “It’s your Dad,” she said. On the way down the stairs, I began going through a mental checklist of things to do—plane tickets to buy, appointments to cancel, people to call—so that I could go and be with my dad in the aftermath of my mom’s death. I took the phone, and for the time in my life, I could not recognize my father’s voice. His words were seared with pain. Over the next few minutes, the story slowly came out. Paul and his wife, Chitadelia, were staying with her parents, who live in a small village about seven hours from Manila. Early that morning, Chitadelia had gone to the market with her mother, while Paul went for a run. A few hours later, when Chitadelia came home, she realized Paul had not returned. A search was organized, and his body was found near the side of the road. His heart had apparently given out. Often sung at the Covenant church during baptisms and funerals, it was written by a young Swedish woman named Lena Sandell, not long after her father drowned in a boating accident. Sandell was with her father in the boat and was unable to save him. That morning, I lay in bed, held my son in my arms, and knew that even in this darkest hour, God had not forgotten us. And, as I would learn over the next weeks and months, neither have his people. It’s a lesson I’d learned many times. One of the first times was in the early 1990s. By this time, I’d left behind my hometown and moved 1,100 miles west, to Chicago, and had become a card carrying Evangelical. I’d had a born again experience, coming forward to give my life to Christ during a youth conference; graduated from an evangelical Christian college; been a counselor at a Christian camp (nothing like the camp portrayed in the film Jesus Camp); spent two weeks in a mountain village in Haiti on a mission trip (we painted walls at a school, hauled cement blocks, and played soccer with school kids); spent many long winter nights as a volunteer at a homeless shelter; played guitar in a church worship band; lead three Bible studies for college students; and even studied New Testament Greek in preparation for going to seminary. But as I walked up the stairs to Grace Covenant Church in Chicago on Easter Sunday, my life was in shambles. I’d spent most of the night before drinking at the Irish Eyes, a pub in Lincoln Park neighborhood. I stumbled home around two in the morning, but despite the alcohol coursing through my veins, sleep never came. Fortified by a pot of coffee, I found my one and only tie, put it on over a dress shirt and pants, and went to church. Two years earlier, Kathy and I had been married on the campus of the Christian college we attended. Our friends and family packed out the chapel, and many of my friends from Habitat for Humanity, where I worked, were there as well. My friend Olumide Adeolu, a Nigerian exchange student who volunteered with Habitat, was there as well, dressed in some of his finest clothes from home. But our marriage was troubled from the start. Kathy was 21, and had graduated from college two weeks before the wedding. A few months after we were engaged, she told me she thought we were rushing things. She wanted to take some time to herself, to get established in her own life before getting married. She wanted to marry me, but not so soon. Fueled more by hormones than common sense, I talked her out of waiting and on June 4, 1988, we were married. A year later, we separated, and spent the next few years in limbo, trying to decide what to do. We didn’t want to live together; we didn’t want to get a divorce. This was not the way things were supposed to go. 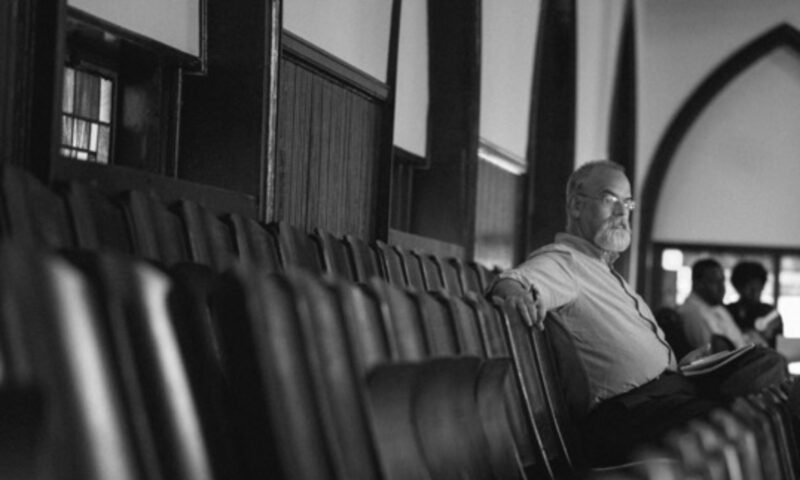 For about six months, I’d been hanging out in the back pews of Grace. A few people knew my story, but I kept much of it to myself. I wanted to be anonymous for a while. Gerry Klatt stood at the top of the stairs as I came in. Gerry and her husband, Fred, both in their early sixties, were always immaculately dressed, and a smile broke across Gerry’s face as she saw my tie. Most Sundays I came to church in jeans and sneakers, with my long hair tied back in a ponytail. She grabbed hold of me as I reached the top of the stairs, and held me close. The previous year had been difficult for Gerry. Fred was having heart problems and one night things got so bad that a call went out on the church’s prayer chain (a telephone tree for sharing prayer concerns) that Fred had almost died. Since Gerry didn’t drive, she took the bus every day out to the suburbs to see him in the hospital. He was home now. But the thought of losing him was never far from Gerry’s mind. She and Marnie, another woman from church, had become very close: Marnie’s husband, Richard, who had started coming to church just a few years earlier, was dying of cancer. One Sunday, not long after Easter, the two of them would stand at front of the church and give thanks that God had preserved their lives so far. It was like seeing the resurrection firsthand. Grace had been through a resurrection of its own, starting a few years before I arrived. The church had once been thriving. But years of slow decline followed, and so by the 1980s, only a handful of faithful souls were left. A young minister named Stuart McCoy was assigned to the church as an interim pastor. His job: shut down the church with as much grace and dignity as possible. Once it was shut down, the building would be sold off and the funds used to start a new church somewhere else. Fred Klatt had other ideas. “Keep the doors open,” he told Stuart. And he decided to heed Fred’s advice. Over the next few years, the church grew, filled with young families and well as folks from the neighborhood. But it remains a thriving outpost of God’s kingdom. A place where people find healing and hope. And sometimes a miracle or two. About six years into our time at Grace Covenant, Kathy and I had another crisis. With our marriage intact and growing, we’d begun to think about having kids. We tried, in the normal ways that married couples do, to start a family. After about a year, we went to visit a doctor. The news was not good. We were infertile. It was unlikely, as my doctor put it, that I would ever father biological children. And we might as well give up. We could go see a specialist –but that was a waste of time, he told us. This particular doctor didn’t have many people skills. So we ignored his advice. Instead, we went to several specialists, tried all kinds of treatments and tests—but nothing worked. Then our friend Leith Fuji gave me a call. Leith was serving as the interim pastor at Grace. Stuart had accepted a call to another congregation out of the East Coast and bid us a fond farewell. Leith—then a missionary in training—was willing. How would it be, he asked, if the church prayed for us during a Sunday service? We’d already been doing lots of praying—especially with our small group, a collection of young couples who met every week at the home of our friends Denise and James Hopp. By this time, I was prayed out. But we have a medical problem, I said. So it’s not going to work. But go ahead and pray. As did many of our friends. We stood at the front of the church and they prayed for us. Our friend Laurel, normally mild manner, was particularly insistent, telling God that he needed to get a move on and send us a baby. We all wept that day. And hugged. And hoped a little that our prayers might be answered. Then we went back to the treatments. And more failure. At some point, our insurance company decided that they’d made a mistake in approving our treatments—and stuck us with a $7,500 bill. After a few months of long phone calls—and few dozen faxes—the insurance company agreed to hear our appeal. As I was walking out the door to head to the appeal meeting, the phone rang. On the other end, was an apologetic middle manager from the insurance, telling me that there was no need to come the hearing. She’d looked at our file and approved all the payments. Still, she said, that was it. No more treatments—unless we wanted to pay out of pocket. Then something unexpected happened. Kathy stopped me in the kitchen one day, with a puzzled look on her face. A few weeks later, she was still puzzled. And a bit annoyed. “I’m still late,” she told me. So she went out one afternoon to the drug store and got a pregnancy test. We knew it would be negative—but she wanted to check. Not for a minute did we get our hopes up. Then the test came up blue. A few days later, Kathy stood up in church, during the time of sharing prayers and concerns. About six months later, our oldest daughter, Sophie Grace was born on the day after Christmas. God had been kind to us and answered our prayers. We have some dear friends, who also prayed for a child, and their prayers were not answered. I’ve got no answer for why we experienced a miracle and our friends did not. All I know is that our church carried us when we had no faith and prayed our daughter into existence. They carried us again after my brother died, with small acts of kindness and signs of grace. Our friends surrounded us with God’s love. Less than an hour after my parents learned of my brother’s death, their church sprang into action. That call had come at about four in the morning. By six their pastor, Kent Palmquist, came to the house and prayed with them. Dozens of people brought food, or came to the house just to sit with my parents and talk with them. Dwight Nelson and Brian Zahasky shared our tears. Friends brought meals. My friend Chris Becker walked in and gave me a hug on the morning we found out Paul had died. Other friends cashed in their frequent flier miles so we could all make it home for the funeral. All these acts of kindness are holy. They are sanctified with God’s presence—transformed from the ordinary and commonplace into expressions of grace. That grace fills every moment. Toward the end of her book, “Righteous: Dispatches from the Evangelical Youth Movement,” author Lauren Sandler experiences a similar revelation during a visit to a megachurch in Colorado. Forty years ago, my family came to a church as strangers; curious to find out more about God but suspicious of church people. We found kindness and a warm welcome—a celebration that we, like the prodigal son in the parable, had come home. We found the communion of saints. In the end, the evangelical movement isn’t built on politics or marketing. It’s not built on the charisma of megachurch pastors or celebrity authors and the powerful heads of institutions. It’s not built on money or power. Instead, it’s built on friendship – God’s friendship with his people, their friendship with one another, and their friendship with their neighbors. And on the day to day faithfulness of ordinary people, who offer the world the kindness of strangers.